Have you ever sat back and wondered if something special was just sailing away while you were busy meeting life's demands? I expect everybody has felt that way. And it appears that something special actually did sail away while I was busy Tuesday afternoon. 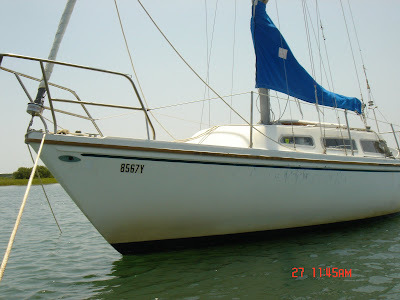 Because sometime between Tuesday afternoon and Wednesday morning at 8, somebody sailed away in my sailboat. I didn't believe it at first, but it appears that I now have a wonderful view of some empty water with no sailboat sitting in it. I'm not asking the question, "Why me?" so much as I wonder, "Why my boat?" For the same reason that I always try to park next to the most expensive car in the parking lot, my little boat was surrounded by much nicer boats with lots of cool gadgets. Why wouldn't somebody take a boat that's worth a little more? It's still conceivable that it drifted away on it's own, or even sunk in 15 feet of water. I'll have to check the sinking hypothesis when it's not 45 degrees and raining. Until then, if anybody happens to see an Edward Teach wannabe trying to blockade the harbor with a mid-70s Catalina, please tell him that I want my boat back. To the unknown driver: Thanks for the friendly "I'm sorry" wave after your less than pristine driving. During the middle of October of last year, I put together a list of Charleston things to do. Some friends suggested a few additions to my list. Take pictures at the Angel Oak (arguable the oldest thing this side of the Missisip. Every once in a while, somebody mistakes me for someone, or something, I am not. Usually it's just a wrong number. About twice a month, I get a call from a random 803 area code number. Usually it's just somebody asking for a person with a name like T-money. I once replied to a caller with the wrong number, "Yeah, this is T-money. What you want?" But I never could manage to craft my way through much more fake conversation than that. An old man named Brother Smith once left me a voice mail message apologizing for a disagreement between he and brother Williams. I'm not sure how, "Hey, This is Josh. Leave a message" didn't clue him in to the fact that he was leaving a message at the wrong number. Nonetheless, it was a moving apology. Other times, random people have mistaken me for people they knew. It's always fun to see the look of embarrassment written on a stranger's face when you turn around after they mistake you for a friend or family. Not only have they created an awkward social situation, but they've also essentially admitted that they haven't been observant enough to discern a loved one from a random one. Two or three times after the movie "Spider Man" came out, some elementary school children mistook me for Toby McGuire. I guess they couldn't tell one scrawny white kid from another. But last night, while eating dinner with John B and Amber, I might have received the biggest backhanded complement of all. The Manager/Owner of The Crab Shack on Folly Beach credited me as the owner of a beautiful silver Porsche Carrera that was blocking some cars from exiting the parking lot behind the restaurant. I guess that means I either looked like somebody who could afford a Porsche, or I looked like the biggest jerk in the restaurant. Help wanted: Applicant must be a current or former Muslim Extremist with working knowledge and experience recruiting and training of suicide bombers. Future dental practice seeks your expertise in motivation speaking and logic coaching in order to convince more patients to floss. Previous dental experience not necessary, although the ideal applicant will have most of his teeth and understand basic oral hygiene. Why kill hundreds of people when you can kill millions evil, cavity causing anaerobic bacteria? You can use your talents to ease suffering, save teeth, extend lives, and eliminate the little bit of blood that swishes out after non-flossers brush their teeth. That's right, a (hopefully) successful future dental practice wants you to be a full-time dental hygienist. Clearly, you are very talented at convincing people to the rightness and justness of your cause. If you can convince 20something year old men to blow their guts into oblivion with a promise of paradise with 40 virgins, then perhaps you could extend your talents to a new field by using your guile and talent to eradicate the evil Zionist gingivitis. Full benefits are available to qualified applicants, however we cannot make matching contributions to 401k's involving dozens of virgins or paradise. Until a few days ago, I wouldn't have recommended that anybody else upgrade to the new version of blogger. Sure, the Beta version (now the NEW blogger) made it easier to edit your template, had faster uploads for new entries, and offered a few new templates. But it had a terrible downfall: I couldn't get Firefox to remember the password for the Blogger Beta. I don't know what changed since three days ago, but Firefox now happily remembers my Blogger password along with all of the other inconsequential passwords that I don't care to type. I no longer regret switching to the new thing. I've been reading a blog for a while, and I thought you might like to check it out: Creating passionate users. It mostly discusses software marketing (which I have no use for) and brain tricks that marketers use (which everybody has a use for). I like the models and the ideas such as: Don't have a product everybody "kinda likes." Make something that everybody either hates or loves. I haven't been writing a lot lately, and I haven't written much that involved a lot of thought. I propose two reasons/excuses. I really haven't been thinking that much lately. I've done plenty of memorizing, but not a lot of thinking. Something's up with my right hand. Two fingers keep going numb. Typing makes it worse. I've scheduled a visit with hand doc. How to be a bad blogger: update sporadically. Yes, I've been a bad blogger. I'll be sure to flog and whip myself at a later date. In my defense, I have been busy. I don't know what logic the powers that be use to create that schedule that is, but they created a monster a semester. Fortunately, it will be my last semester of grinding through page after page of .... um... information. In a few more months, I intend to graduate to grinding bigger and better things: such as body parts like teeth and bones. 4-year-old Austin may have had a good idea. After school his first goal in a soccer game, he asked his coach for his trophy. Maybe after my first test is over, I'll make a request for a diploma. For as long as I can remember, surely before I knew anything about US geography, Papa would sing a funny song about Tennessee whenever he wanted us to lay down, be still, and go to sleep. Despite years of practice singing tenor and base in a capella West Texas churches of Christ, his voice would crack a little when he'd reach for high notes, but it didn't matter. My eyelids would still turn into 100 pound weights before he'd reach the third line. Patti Page popularized the song, Tennessee Waltz, in 1950, and I suppose Papa has been singing it ever since. It's ironic how a sad, half-century old song about losing your girlfriend to a "friend" continues to bring back warm memories every time I hear it, think it, or well.. sing it..
By the way, I'm getting pretty sleepy, so I think I'll take a good nap now. You can make a lot of money. You can make a lot of friends. But you can't make a lot of both. My crystal ball says the the weather over the past few days has been too pretty to blog. In lieu of a real post, I choose to refer you to an old lifehacker article: cleaning up your snail mail. Gamecock basketball has become a national embarrassment. I expect the only productive player--Tre' Kelly to quit trying sooner rather than later. Quote from a source to remain unnamed: "My wife is an animal rights activist. If you happen to wander into our yard in all fours, she'll give you a bed and plenty of food. The bad news is that she'll also de-flea, de-lice, and spay or neuter you." Memories from MLK day coming soon. While I enjoy the smell of cigars and pipes, I abhor cigarette smoke. It stinks, makes my nose itch, causes my eyes water, and it makes me cough. Most of all, it just really pisses me off. I'm baffled by the millions of cigarette smokers who insist that it's their right to poison the air that I have no choice but to breathe with more than 40 carcinogens. They complain that smoking bans infringe on their right to enjoy a cigarette, yet they could care less that their smoke wafts into my air--and I believe I'm entitled to clean, healthy air. When Charleston kids put things into their teacher's drink a few months ago, they were accused of assault. If I put lead in your drinking water or poison your food, I've committed a crime. Yet you poison my air and call it your God-given right. I have nothing against other people putting bad things into their bodies. If you want to smoke, I'm very happy for you; however, if you want to make me smoke your smoke, then we have a problem. MUSC had a very serious problem because there was no refuge from the smoke, and I'm pleased to announce that I'm very pleased that MUSC has announced restricted smoking areas around the hospital grounds. Now the many nurses, doctors, patients, nervous visitors, and students will be forced to smoke in herds instead of spread out all over the entire campus. Unfortunately, the restrictions don't go far enough. This clean air attempt was actually spearheaded by MUSC student government, but it met some resistance from MUSC's board and the lawyers, who, for fear of lawsuits, watered down the smoking ban to the point that it is very nearly meaningless. 1. There is no enforcement, and no penalty has been prescribed for those smokers who insist on polluting wherever they please. We need a smoking ban with teeth. 2. The smoking areas are still right next to entrances. I'm not real sure who decided on the locations for the designated smoking areas, but whoever made that decision must think that the smoke goes straight up into the atmosphere. The main smoking area is directly outside the major hospital doors, and I still walk through a cloud of smoke every time I walk into the hospital. We need a smoking ban with some more thoughtful designation of smoking areas--perhaps completely abolishing cigarettes from MUSC's campus. But if MUSC's board of reagents can't handle that, then I'd humbly settle for smoke-free entrances. For the fourth time, I've sworn off the Folly Road Taco Bell because I'm convinced that it is undoubtedly the worst Taco Bell in the United States. I would claim that it's the worst in the world, but I'm not sure if international Taco Bells exist. I have never had a good trip to that taco bell. They ALWAYS screw things up. Every few months I try them again because.... well, I'm cheap. After watching a quarter of the Florida Alligators punishing Ohio State, Amber and I decided to make a quick run to Taco Bell. Amber hates lettuce. It goes against every part of my being to make special requests of fast food workers, but one must choose whether tis nobler to combat the girlfriend, or to combat the restaurant workers. I once made the mistake of combating the girlfriend... but that's another story entirely. Retarded Taco Bell Employee: So you don't want lettuce on the soft tacos or the crunchy tacos. Me: Only hold the lettuce on soft tacos. RTBE: okay, so you only want no lettuce on the soft tacos? Somehow we ended up with no lettuce on everything. I think they screwed up pushing buttons on the cash register too. The receipt had nothing at all to do with our order. I have no idea what that cash register girl did. If the Folly Road taco bell owner/whoever ever happens to read this--I hope you're upset. Oh, and I hope that you'll let me inform your sorry workers that they're fired. They're consistently the worst I ever saw. I've been unmotivated to write lately.